Why is the US not fighting equally hard for families? International Women’s Day inspired me write about women in construction, but that sent me on a different path that encompasses not only women, but families as a whole, and the support system that our country provides to keep highly skilled and intelligent individuals in the workplace. The US government hasn’t decided to prioritize and invest in its own citizens who want an equally prosperous life – families. 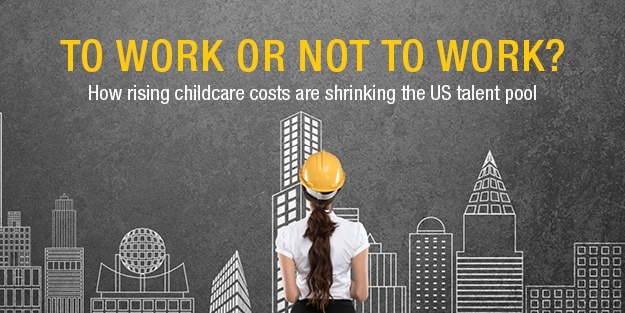 Families with children have to choose between not returning to work or paying exorbitant childcare costs. Why? The US government offers a measly $5k child credit in the new tax law. Big deal, $5k buys you childcare for one or two months only. Why not offer $24k-$30k per child in credit or make childcare costs 100% deductible? Let’s invest in our most educated resource – our workforce. A tax credit means you have to earn money to get it, and both women and men want to work, thus will earn more, pay taxes and can use the credit. Did you know 57% of students in college and graduates are women? Yet after having a child, many families must make the difficult choice for one of the parents (in most cases, women) to stay home over returning to work due to the cost of childcare. This means we have a country where around 50% of our highest educated people are leaving the workforce. If the key to a balanced and successful country is getting its citizens educated and contributing to the economic engine, why are we forcing families to remove one educated job participate from the economic machine? Why are we forcing them out of work when we need all the talent we can get? Laws have improved giving both mothers and fathers more time off to bond with their babies but more can still be done. We need tax laws that support women, men and families and make the financial burden of childcare costs go away. If we do not push our legislatures for it, we will continue to lose our highest educated resources. When I became a partner at Skyline in 1996, it was a newly-founded company. There were no women in our project management department. ZERO. 22 years later, 25% of our project management group and 40% of our leadership team is comprised of women. We are about to appoint our first woman to our board of directors, Jessica Carps, and we are a better organization because of this depth and brain power. What are we doing at Skyline to foster women in construction? Twice per year we evaluate the salaries of employees to ensure that women at Skyline are consistently compensated with their male counterparts and make necessary adjustments to level the field when discrepancies appear. Last year, the Skyline Women’s Network was created to promote and support inclusion within our organization. We are also trying to take matters into our own hands in terms of supporting our talent pool by developing a “menu” of benefits that allows every employee to select the options that are pertinent to them based on their stage of life–this includes providing financial aid to offset childcare costs.